Artists from across Canada arriving in London, Ont. for this year’s Juno Awards are being met by adoring fans thrilled to snap a selfie at the fan fare meet-and-greet. Brett Kissel and The Reklaws signed autographs, hip-hop artist KILLY live-streamed the moment he found a holographic poster in the crowd with his face on it and Loud Luxury posed for photos in the city where it all started for them. But it was the promise of a performance by Johnny Orlando that had a group of young fans screaming with excitement at the mere thought of meeting their 16-year-old idol. “It’s going to be very, very dedicated … I don’t know how to describe it!” said Jaelyn Harvey with a hand on her heart while her friends jumped in excitement ahead of Orlando’s performance. The moment lived up to the hype. “We smiled at each other, he gave me a hug,” said Harvey, her friends hardly able to contain their excitement while adding captions to photos for social media pages. Orlando, who is nominated for the breakthrough artist of the year award, shared video of the four showing their excitement on his Twitter account. The pair that make up DJ duo Loud Luxury are soaking up all the special moments that come with a group’s inaugural nomination in the city they first met. “Being able to come back home and have all of this go on is so awesome, it’s so cool,” said Joe Depace, who remembers all the missed calls from his parents the day the Juno nominations were announced. “You just got nominated for four Junos!” Depace remembers his family yelling into the phone. Andrew Fedyk was shocked by the line of fans waiting to see them on Saturday to the point he didn’t believe it was for them. “Someone told us this line up was for us and I was like, ‘nah, there’s got to be someone else coming, too,'” said Fedyk. 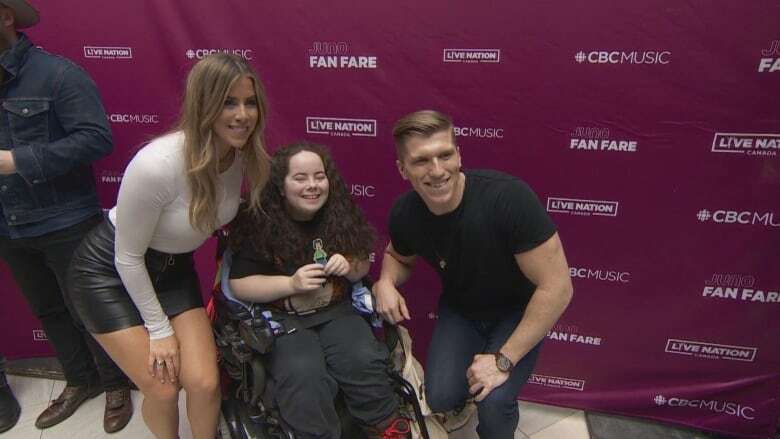 People jammed Masonville Place to meet artists like Meghan Patrick, Tyler Shaw and Washboard Union ahead of Sunday’s show, with some fans pouring out their hearts at the event. “There was a fan that cried when she met us, which was very heartwarming and mind-blowing for us,” said Stuart Walker, one half of the sibling duo that makes up The Reklaws. His sister, Jenna, said she’s proud of the fans for the way they’re able to connect with each other at events like these. “They’re like our friends!” she said, describing their fans as loud and proud. The Reklaws are nominated for country album of the year and a win could cap off a very eventful week.